I can hardly stand it anymore! I wake up in the morning, and get on my elliptical for a workout only to read that another dark tragedy has happened in America. Of course, my mind – like everyone – immediately assumed this was some religious extremist act of violence. 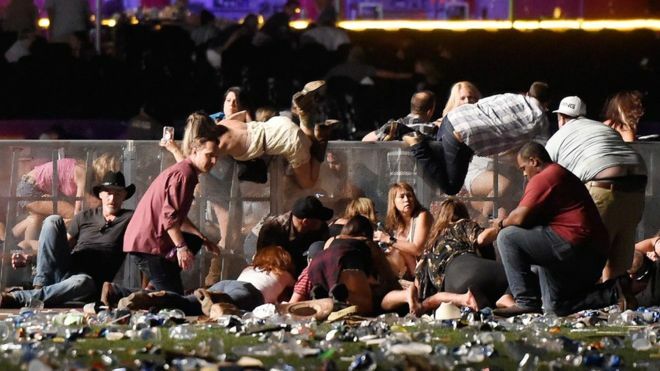 Yet, now we’re finding out this horrific act of violence was perpetrated by a 64 year old white dude, whose act apparently came out of nowhere making his own family feel like they’d “been hit with an asteroid” when they heard the news about what their family member did on the 32nd floor of the Mandalay Bay Hotel. Lord make me an instrument of your peace. Where there is hatred let me sow love. Where there is injury, pardon. Where there is doubt, faith. Where there is despair, hope. Where there is darkness, light. And where there is sadness, joy. O divine Master grant that I may not so much seek to be consoled as to console, to be understood as to understand, to be loved as to love. For it is in giving that we receive, it is in pardoning that we are pardoned, and it’s in dying that we are born to eternal life.